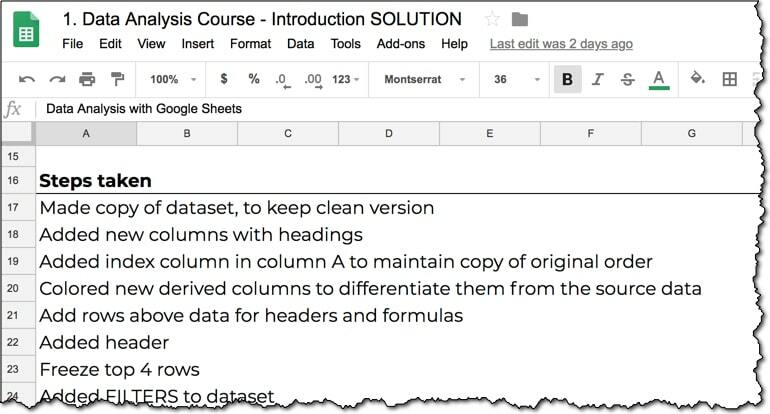 This article outlines 18 best practices for working with data in Google Sheets. It’s a compilation of my own experiences of working with data in spreadsheets for 15+ years, along with the opinions of others I’ve worked with and reports and articles I’ve read online. By no means is it meant to be exhaustive or the last word on the subject, but if you follow these guidelines, you should have a robust data workflow. Following these best practices for working with data will make you and your team work more efficiently and reduce the chance of errors (human or computer) creeping in. It’ll make your work easier to follow and understand, and add value to your team’s or client’s workflow process. It’s a good habit to have, and it’ll serve you well as you progress with your data career. Projects are more likely to be successful when there is good communication and a good organizational structure. A big piece of that is good data management, and that starts with implementing a well-organized, logical and efficient folder structure. As your projects grow in size, it becomes more and more crucial to keep your Google Sheets organized in a meaningful way. At a minimum, you’ll have a top level project folder and inside that, you’ll want separate folders for your raw datasets, for your analysis and for your final deliverables. Files can move from one folder to the next (or be copied from one folder to the next) as the project progresses. Surely this is redundant in the age of cloud data, right? On the one hand yes, there shouldn’t be a need to backup your Google Sheets. Google has so much redundancy built in, your data should be safe from getting corrupted or lost. And you can rely on version history to go back in time to an earlier version of your Sheet should you need to. You can restore files from trash, although once you’ve deleted them from trash they really are gone for good (I believe there’s an exception for admins of school G Suite accounts however). So your data should be safe. On the other hand however, your account could still get hacked or a colleague could (accidentally) delete a crucial file, and you could lose data that way. For anything that’s really important, it’s worth making a copy, either in a different google account if you have one, and/or offline (as a CSV or excel file). It’s definitely not necessary for everything, just your mission critical stuff. It’s also worth mentioning that making a copy of a Sheet means the new copy does not have the version history, which can be an advantage or disadvantage depending on your situation. It’s generally a good idea if you’re sharing the Sheet and don’t want anyone to be able to see all your workings to get to the final result (maybe you deleted confidential data for example). This is often left as an afterthought or worse, just not done at all. However, it’s absolutely one of the best practices for working with data. It just requires a little effort. There’ll come a day when you’re glad of some notes about where your data came from, what assumptions you made, what calculations you decided to do and how you did them! It doesn’t need to be super long, just enough detail to allow you or someone else enough information to understand and recreate the analysis. However, it would be worth mentioning where your data came from, what major steps or tests you did and how you did them (e.g. “Ran pivot table to determine aggregate sales metrics”), as well as any assumptions you made. If you’re creating a dataset, then you should also create a data dictionary, where you explain what data each column holds. A data dictionary is just a list of column headings in a separate tab, with a note explaining each column, for example what the units are, whether it’s been normalized, how it’s been calculated etc. As spreadsheet users, we typically use 2-dimensional, wide format tables. The rows and columns represent categories or measures (for example, regions vs. months). It’s easy to understand this grid format and charts and calculations lend themselves better to this layout, since you can run calculations across rows or columns. 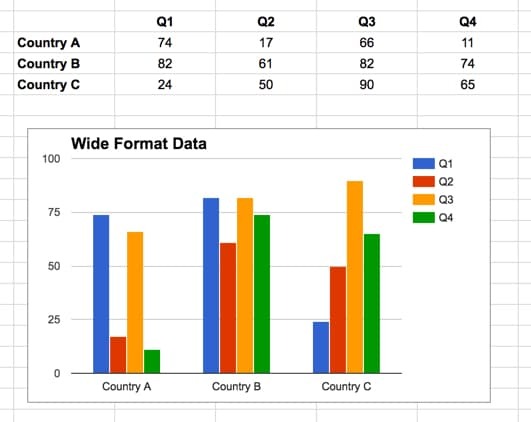 The Google Sheets chart tool expects data in a “wide-format” table rather than a traditional “tall-format” table (which is how data is stored in databases). This “wide-table” format makes it easy for the chart tool to parse the data and show it correctly. There are no blank rows or columns. The X values (the Countries) are in the first column and the series names (the Quarters) are in the first row. Contrast that with a “tall-table” format (how a database typically stores data) and you can see the chart tool cannot correctly parse and show the data. Note: this is not a case of right and wrong, and you’ll encounter data in both formats and even in between. It’s about using the right shape for the context of your situation. Do you want to create a chart from your data table? Go wide! Do you want to export your data table as a CSV for uploading to your company database? Maybe you’ll need to create a tall format table then. For further reading on this subject, check out this excellent post, Spreadsheet Thinking vs Database Thinking, from Robert Kosara. As your projects grow in size and complexity it pays to develop a consistent naming strategy for your Sheets, for tabs, named ranges, variables and column headings. Historically, computer programmers have avoided spaces in variable names, and although it’s not strictly necessary in Sheets, it’s still a good idea to avoid spaces and non-alphanumeric characters in tab names, named ranges and column names. Certain functions (e.g. inside the select statement of the QUERY function) and certain add-ons still adhere to this strict no-space rule, so although not very common, it will save you hassle. One of the most time consuming tasks data practitioners face is tidying up and cleaning data. The problem is more acute wherever there is user-generated content. Invariably, everyone will use different notations (e.g. US, USA, United States, America, US of A,…), or misspell names, or enter dates with month first vs. day first, etc. Anything you can do to preempt this will save you lots of time on the back-end, when you’re working with the data. One method is to use Data Validation to control what a user can enter into a cell. For example, you could present them with a drop-down menu of choices (instead of a free-form field), or restrict the cell to numbers only, or to positive numbers only, or all sorts of other data validation options. 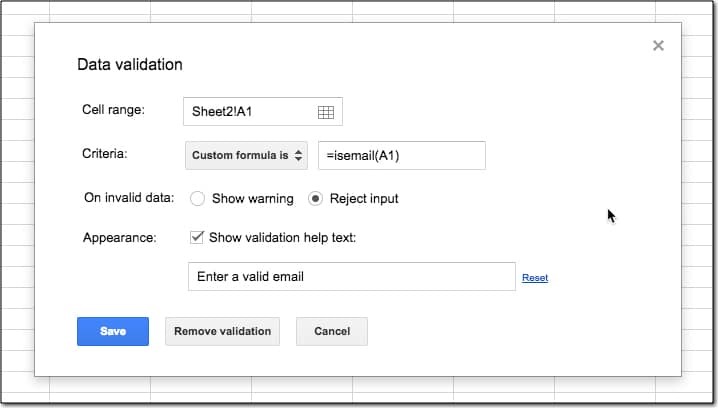 Here’s a more detailed example, combining the ISEMAIL function with data validation to ensure only valid email addresses can be entered into your Sheets, ensuring better data accuracy going forward. In the cell where an email address will be entered, for example A1 in the image above, right click and choose Data Validation... or go to Data > Data Validation... menu option, which opens this popup. Google Forms are an even more robust way to collect user inputs, because it separates the data collection from the data storage/analysis. This will prevent users accidentally (or intentionally) overwriting data and/or seeing data from other users. 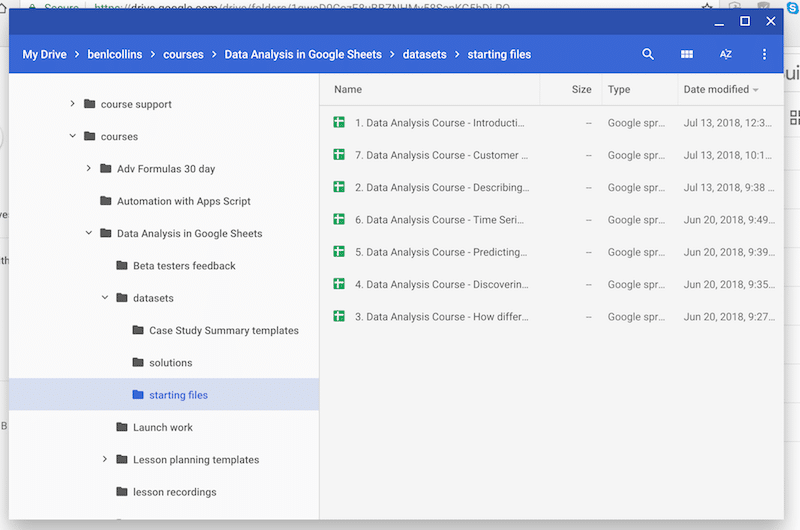 They’re super easy to setup and pair seamlessly with Google Sheets. I use them for all of my own audience surveys and course feedback surveys. I’ve written about using Google Forms before, in this article. Each cell should contain just one piece of information. Don’t be tempted to put more than one datapoint into a cell. Cells with single datapoints can be used in formulas and charts without issues. Those with multiple datapoints, well, they can’t. Note, you often get data in this format, with multiple datapoints encoded in a single cell, and it’s your job to split that data out into separate columns, so you can do your analysis. This is covered in the Data Cleaning in Google Sheets course. It’s helpful to be able to distinguish the original raw data from any columns you’ve added in the course of your analysis. You’ll quickly lose track of the original data columns if you don’t mark them, and I’ve found adding a subtle color to the whole column is the quickest and most reliable way of indicating this. Can you tell which are the original and which are the columns I’ve added in this example? Don’t use formatting exclusively to communicate data, merely to augment underlying data. Having just told you in the previous point to distinguish columns by color, I’m now telling you not to? What?!? In the previous point, color was used to make your life simpler, to help you quickly identify what was original data and what was calculated columns you’ve added. It’s not communicating data, it’s simply facilitating a more efficient workflow. In this case, suppose you want to classify revenue numbers into ones that require follow up versus ones that don’t. 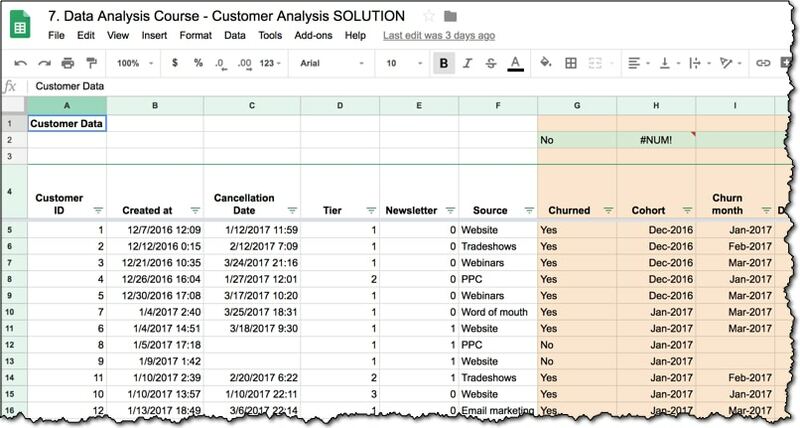 If you use cell highlighting to identify the ones you want to follow up with, you risk that not being understood by other users or worse, being lost if you export your Sheet to CSV, or someone decides to make wholesale changes to the formatting. The color is merely a tool to aid comprehension, to make it easier and quicker for the user to work with your data. 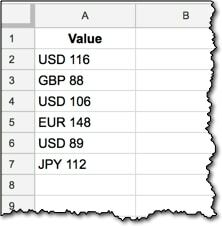 Anytime you find yourself sorting your data, for example to rank largest to smallest for metric X, then you’ll want to add an index column, which will allow you to always get back to the original order. You’ll notice that it’s a colored column, meaning it’s one that I’ve added to the dataset. I’ve been stuck before, unable to reverse the numerous sorts I’d performed and left with a dataset in an order than no longer made sense. There’s a number of reasons why you might want to get back to the order the data came in, perhaps to check for the sequence transactions happened in, perhaps to explain your steps to somebody else, or for sharing the data with other users. This should be something you do automatically without thinking about it. It’s essential once you have more than 20 rows of data, otherwise you’ll lose track of your column headings. Once you’ve used a formula, it’s generally a good idea to turn those “live” formulas into static values, provided you don’t need to keep them active. There are times when you need to keep your formula active because your data is changing and you want the formulas to update in real-time. In that case, it’s totally fine to leave “live” formulas in your dataset. However, if you’ve used a formula to derive a column, for example an IF based on a static date column, and it’s not going to ever change again, then you should change the column into static values. Highlight the whole column and copy the data (Cmd + C on a Mac, or Ctrl + C on a PC/Chromebook). Then over the top of this same data range, Paste-Special-As-Values. Either right click and select Paste special > Paste values only or use the shortcut: Cmd + Shift + V on a Mac, or Ctrl + Shift + V on a PC/Chromebook. This will help to make your Sheets run quicker, which is an important factor if you have large amounts of data. In the previous step, I advocated turning formulas that you’ve used into static values, once you’re finished with them. However, you should definitely keep a copy of them! You’ll thank yourself later when you need to re-use it, and you have it available, or when someone asks you how you derived a certain column. By far the most convenient way to keep a copy of formulas is to paste a live copy into a row above your dataset and leave it there. That way it’ll keep all the relative references intact, so you can quickly copy it into your dataset to use again. Don’t worry if the formula shows an #N/A!, a blank cell or even a wrong answer, what matters is that it keeps the relative references intact. Once you’ve copied your formula into the row above your dataset, feel free to copy-paste-special-values and turn the column into static values as per the previous best practice. Important Note: Purists will argue that you should have a single header row and nothing more. I think there are pros and cons to this header-row-only approach and the “utility” row approach I’ve advocated here. 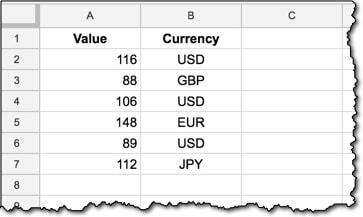 I use both methods, but tend to favor the approach of having a few “utility” rows because I think the benefits of keeping copies of formulas above your data analysis workings is worth the small price to pay to not start in row one. And once you’ve setup your named ranges, the issue falls away anyway. One scenario that I would definitely go with a single header row approach is if I was creating a flat dataset (no formulas) to be shared. This is a good habit to get into, and saves you having to manually highlight your data or type in the range reference every time you refer to your data in a formula. It’ll reduce errors from incorrect range references or mixing up relative/absolute references, and has the added benefit of making your formulas clearer to understand. Merged cells should be avoided in datasets. Just not in your datasets, ok! This is perhaps my favorite of the 18 best practices for working with data, because it’s so simple but so effective. This is a useful tip I picked up from a data scientist at General Assembly in Washington, DC, when I was teaching their Data Analysis course in 2015/16. The idea is to read (out loud if you like!) across one row of your data and really see and understand what’s in every column. It’ll help you know what data is in your dataset, or prompt you to investigate further if you don’t understand what a column shows. Potentially it’ll save you doing unnecessary work, because you’ll know exactly what you have. Developers often keep yellow rubber duckies sitting on their desks to debug their lines of code, so go ahead and follow their example if you like! A tweet from data scientist Hadley Wickham, containing a wealth of ideas and opinions. Data organization in spreadsheets, a research paper by Karl Broman and Kara Woo. Best Practices for Using Google Sheets in Your Data Project by Matthew Lincoln. Anything you’d like to add? Do you follow any best practices for working with data that are different from what I’ve described here? Drop a note in the comments! 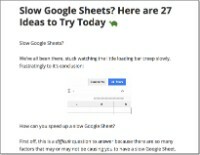 Slow Google Sheets? Follow the 27 techniques described in this article to diagnose and improve the performance of even the worst performing Google Sheets. 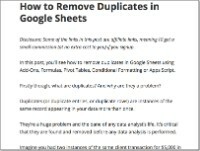 Learn how to remove duplicates in Google Sheets with these five different techniques, using Add-ons, Formulas, Formatting, Pivot Tables or Apps Script. 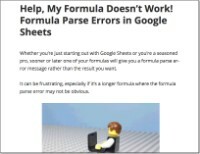 Use the error message from your Google Sheet to understand and fix formula parse errors, including #N/A, #DIV/0!, #VALUE!, #REF! and more! Much appreciated! Have you considered making this available as a pdf or google doc so that users can have a portable/printable copy ? Looking forward to your Analysis course! Thanks again for this as all your points are very valuable. The only advise I can add is to have “Data” Sheets that have the data headers in the Row 1, unlike your example in point 13 that starts on row 4. 3. With all the above your name ranges are easier to maintain. Thanks for your comment. It’s a great point you mention. I think there are pros and cons to both approaches. I’ve used both approaches, but tend to use the approach of having a few “utility” rows above more often. Purists will argue of course that you should only ever have a single header row and nothing more, and I would do that if I was creating a flat dataset (no formulas) to be shared. But I think there are benefits of keeping copies of formulas above your data analysis workings, and it’s worth the small price to pay to not start in row one. And once you setup your named ranges, the issue falls away anyway. True Ben when it comes to seeing the formula’s in data sets to have them above. I normally use a Note on the data header with the formula as I always try to use Array formula’s with my data. I hide my formula in the header so as not to have issues when the data is sorted or filtered. I have a tendency to create notes (per cells) of descriptive rows/columns so that I or others understand the intent of the data set input/gathered/compiled. John – that’s a great idea. Developers are better at including comments in their code to explain what they’ve done to others (and for themselves), but we spreadsheet users don’t seem to do it very often, or at all. So adding notes is a worthy investment of time because it’ll save you headaches in the long run. Great post as usual. Thanx a lot. One suggestion in point 15 of keeping the formula in rows above header. The formula can be kept in the note of the column head cell. That way formula will remain intact and there will not be any need for any row above header row. Yes, that’s another nice way to do it. Thanks for sharing SK! Another tip I picked up from Jay Atwood has been to import data, if moving from Excel to Sheets, rather than simply copying and pasting. Not sure if that relates or is true. “15. Keep copies of your formulas” Was an invaluable tip for me. I am a novice on a fast track to learning Google sheets . I was thinking that this would be a sensible approach but it was very helpful to have the voice of experience confirm it. In the case of item 14, Turn formulas into static values after use, what about to use another sheet and import the values with importrange formula? so we automate the process of copy/paste from our process and still have the data as “static”/value (not a formula). Can we use a range in a online sheet from offline sheet. Like =vlookup(“from online sheet”, “From offline sheet”,0), Is this possible? Thank you! I’m trying to use Sheets as a quick’n’cheap database for a charity, and your thoughts are very helpful. I’m starting to get stuck into this now, and am currently looking at raw data in one workbook (not accessible to most people) and reports in another workbook, using QUERY, FILTER and IMPORTRANGE. I am writing scripts to offer a range of reports from the menu and place the results into a sheet, probably with any charts in another sheet. Are there any practical limits on volumes of data when using IMPORTRANGE? Currently the raw data is reasonably normalised, so most reports will require several imports, with appropriate VLOOKUPs to join the data. Or can you suggest any better way of safguarding the raw data? Love all this! I searched around looking for IMPORTRANGE info. I saw this seems to be the best page to post this. Thanks for the query limits and timeout specs. Very helpful. I wondered if you know the best workaround to the IMPORTRANGE security issue. More info below. What it is: For example: You have two Google Sheets files: ‘secret’ and ‘public’. Users include Friend, access to both, and Stranger, access only to the the public sheet. You go into the public sheet and use an IMPORTRANGE. The public sheet will ask for access to the secret sheet for the function. You approve. Now IMPORTRANGE is approved from public to secret. Then Stranger can go in and use IMPORTRANGE to show all of the content on the secret sheet. eek. Workaround I’d use is to make a ‘middleware’ sheet. Friend puts an IMPORTRANGE call to the secret sheet from middleware only for the public data. Then Friend puts an IMPORTRANGE on the public sheet to ‘middleware’. So even if Stranger does IMPORTRANGE to other areas of the middleware, they’ll never see the other parts of the secret sheet. Not sure if that would work (without manual refreshing) or if there would be a work-around for that. Any thoughts?